Welcome to the home of the biggest and most beautiful crystals in the world. A short scenic journey into Byron’s hinterland lies a tranquil and magical sanctuary. A short scenic journey into Byron's hinterland lies a magical sanctuary. 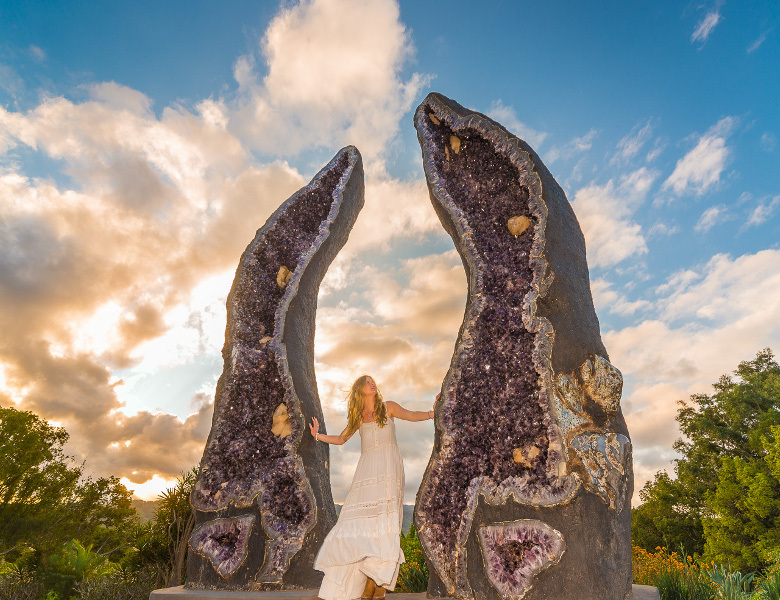 Welcome to the home of the largest natural crystals in the world where you can sit in an ancient amethyst cave. Stand between two of the tallest crystals on earth or take flight in the Wings to Eternity mural. Wander through the tranquil Shambhala Gardens adorned with sacred statues and towering bamboo then touch the World Peace Stupa. Join in daily guided experiences including the famous Peace Experience. Enjoy breathtaking views from the terrace while you sip on fresh local coffee, enjoy a delicious lunch and homemade desserts. Discover the jewel of Byron. Enrich your spirit.